Water is one amongst the basic resources that sustains life on earth. During the urbanization process, this resource tends to get exploitedand neglected. 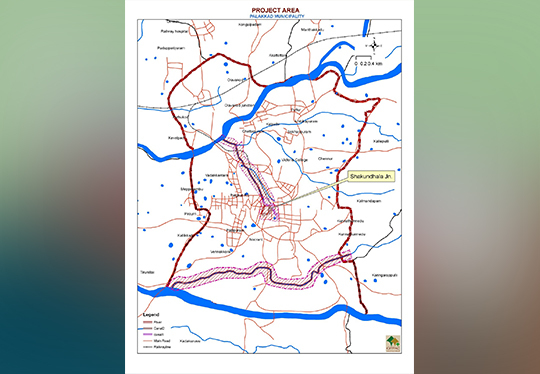 The need for a watershed based urban planning must be stressed in order to avoid or minimize the water-logging situations that unplanned development of urban areas face. The firefighting situation that municipalities deal with year after year during monsoons can be stopped by adopting watershed as a planning unit to solve urban drainage issues. There is urgent need for Palakkad municipality to solve its drainage problem and find a sustainable solution to all its drainage issues. The master plan finds solution in a comprehensive scale and also in micro scale. The area is studied in macro scale using watersheds and also specific problems area wise is also dealt with. Thus the entire municipality is made flood free.